I got one of these things for Christmas, and it seems like a great idea. However, I found that the chuck wobbled; that is, it didn't revolve around its axis. 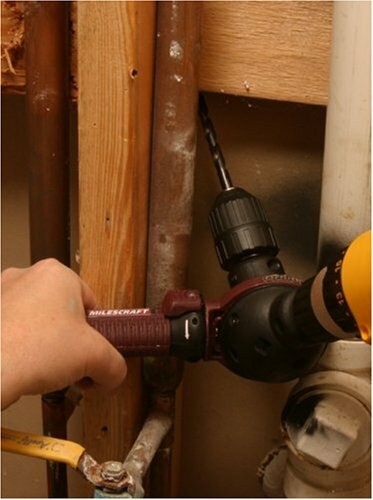 Which means, if you drill a hole with a 1/8" drill bit, the hole will be larger than 1/8". 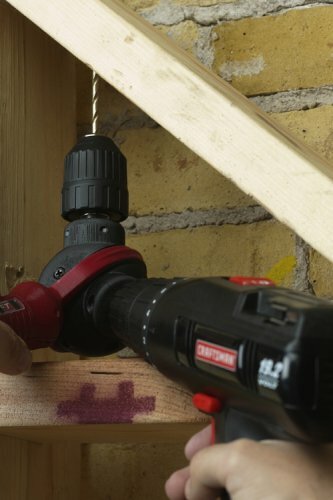 Typically, when you have a bit in your drill, if you sight down the length of the bit while it's spinning, you can see that it remains in a straight line. With this first orbiter the bit was very much NOT in a straight line; I tried 2 bits in it, with the same result. Not to mention the fact that the orbiter just FEELS like it's wobbling. So I'll call my first Orbiter "#1". I took it back to the store and exchanged it for another one (#2). This one was better than #1, but still not right; you could easily see that the chuck was wobbling as it rotated. It would be usable for some things, but still not the way it should be. So I emailed the company, and got a nice email back from a man who said he would send me a new one, and he would check it before he sent it to me. That's the good news. The bad news is, the one that he checked to be sure it was straight, #3, is not as good as #2! I too bought this tool to drill a few studs for electric wires in a remodel project. I got 9 studs drilled when it would only make noise and not turn. I was using a 3/4 inch spade bit and a 14.4v cordless drill. If you are looking for something you can use to drill at any angle this is it. Heavy Duty look and feel. Works GREAT !!!!! This tool takes about five minutes to learn to loosen, adjust, and tighten. It's fairly heavy and I've used it maybe a dozen times with no issues. It's a great idea and very handy even on the drill press at times. 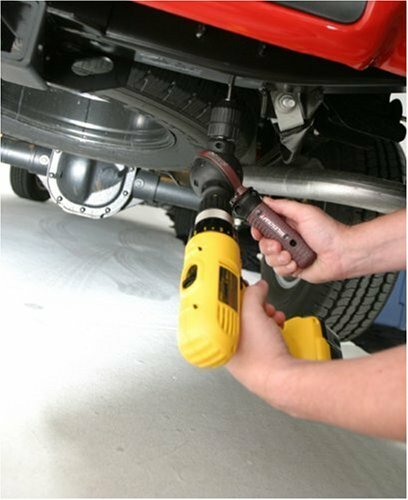 You can use this drill attachment at any angle between 90 and 180. The handle, which you use to loosen or lock the attachment into the desired angle, is a big help during the drilling process. 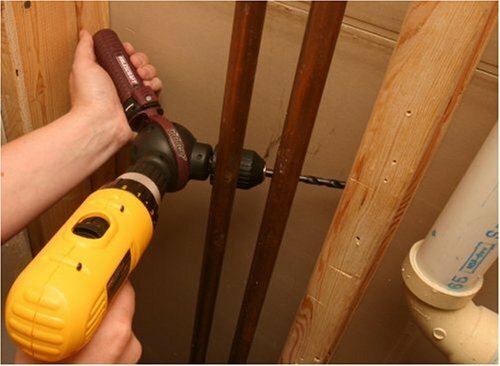 Depending on how you wish to apply pressure to the drill chuck, either by pulling or pushing on the handle, you can loosen the handle and change angles until it's "just right" and comfortable. At the price + shipping, it's very very reasonable for the quality of the product. It works much better than the $18 fixed-at-90 degrees drill attachment, sans handle, I picked up a couple of years ago. Oh, and because you can lock it at 180 degrees, you can drill straight while using the handle for better "handling" and ease of use. I may pick up another to give as a gift to my best friend. I wish it was smaller but it would also remove its durability and flexibility as well. This is a great product. If you want to treat it as a full angle drill I would suggest getting one as this is not a substitute. However, treated as a jig for a drill it can solve a lot of problems at a decent price. It works as promised and it ingenious in design. I'm not a great fan of keyless chucks as I find their slippage a pain in the behind but this works better than most I've used and so far no slippage. 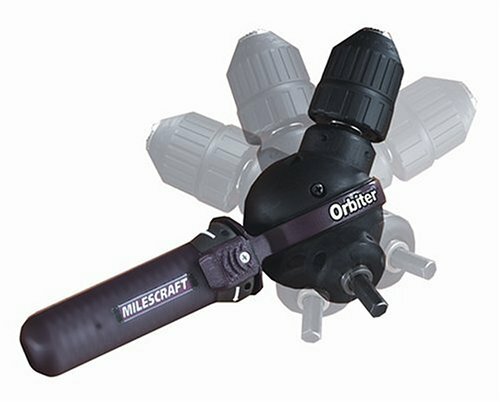 After reading other reviews I proceeded to order the Milescraft 1300 Orbiter just to have around the house for those odd occasions that require drilling in difficult spaces... big mistake!!! I did notice, as at least one other reviewer pointed out, that the run-out or wobble of the drill bit was pretty significant. That didn't bother me because I typically wouldn't use this item for precision drilling so 1/16 of an inch error, give or take, is not a big deal for my intended use. Finally the day came (months after I received the 'Orbiter') that I needed to put a hole in a 2X6 with limited clearance. I'll spare you all of the details of what happened during my attempts to put a hole through 2" of pine but my attempt was unsuccessful. I don't know if I hit a knot or possibly a nail coming in from the unseen side but the 'Orbiter' self destructed on the very first use. Apparently the gears inside must have stripped. Turning the input shaft no longer results in motion at the output shaft. My conclusion is the 'Orbiter' is a flimsy POS that has no practical use in my tool box. They probably should have put a maximum of 1/4 inch chuck on the output side to prevent the unit from being so easily overloaded. I was using a battery powered 3/8" VSR drill. I can't imagine how quickly the 'Orbiter' would have self-destructed if I had used my corded drill, with serious torque, instead. From what I can see this product is a TOY not a tool. Give it to a child and warn them not to be to rough with it. I am not familiar with Milescraft but if this is representative of their product line I won't be buying any more of their stuff. In fairness to them I have not attempted to return the item or have it repaired under warranty or even spoken to or notified them of my experience. My view is what's the use. It seems like they used cheap plastic gears inside the 'Orbiter'. 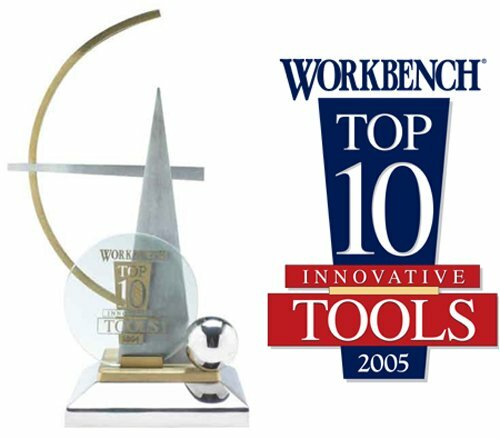 While the design is novel and could be useful, this device is certainly not up to the standards I would expect of a real tool. If I contacted the company and they sent me a replacement I would still have a flimsy POS that I wouldn't use so why bother? 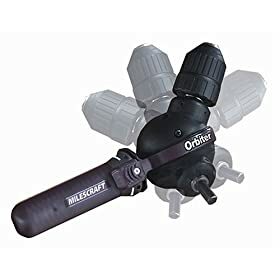 If you are inclined to buy an 'Orbiter' I recommend you use very small drill sizes and don't try to drill anything hard such as metal or hardwood. Read the other reviews and take their message to heart. If you have an extra $30 and want to find out for yourself how good the 'Orbiter' is go ahead and get one. Just don't be surprised if you too find it isn't capable of doing real work. I ignored the other reviewers comments thinking "How bad can it really be?" Now I know, I didn't learn from other peoples experience and had to find out firsthand about the 'Orbiter'. Okay so I should have listened to the other reviewers and didn't. Again, to be fair, perhaps I just got a defective 'Orbiter' and they really are wonderful, durable tools that will stand up to years of use without failing. IMO, doubtful but possible. I am only one user and only have experience with one 'Orbiter'. Statistically this is an insignificant sample. While I applaud the design concept it appears that the choice of materials really degrades the potential of the 'Orbiter' from being a useful tool to a useless toy. Would it have cost that much more to make it a robust product? Could it have been designed with a friction clutch to prevent the gears from stripping if it encountered greater torque than it could handle? To me these apparent 'short comings' in the design and manufacturing of the 'Orbiter' will keep it from ever becoming the hit product it could be. To bad for tool freaks like me who love to have all the nifty gadgets that make DIY projects a breeze. IMO, this device fell so short of the mark that it cannot reasonably be considered a worthwhile investment. A real disappointment as I had high hopes for the 'Orbiter'.